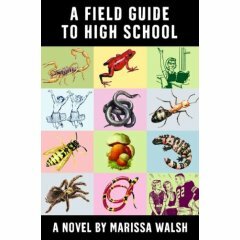 Andie lives in the shadow of her overachiever sister Claire, but Claire is leaving for college and Andie and her friend Bess are about to start high school. All very scary, except that Claire is determined that Andie should be all prepared and left her younger sister a guidebook to navigating the wilds of Plumstead Country Day School. In this guide, Claire outlines the do's and dont's of school assuring Andie will know how to avoid the pitfalls. While billed as a funny book, it actually came across a bit dry. Much of the "advice" seemed either cliche or like an inside joke (like you would get it if you knew the school she was referring to). But it was all fairly harmless and entertaining to read. What was far more annoying was the story around the guide itself (the conversation between Andie and Bess) -- easily identifiable by the bold type. My advice would be to skip all of those sections and just enjoy the guide itself.